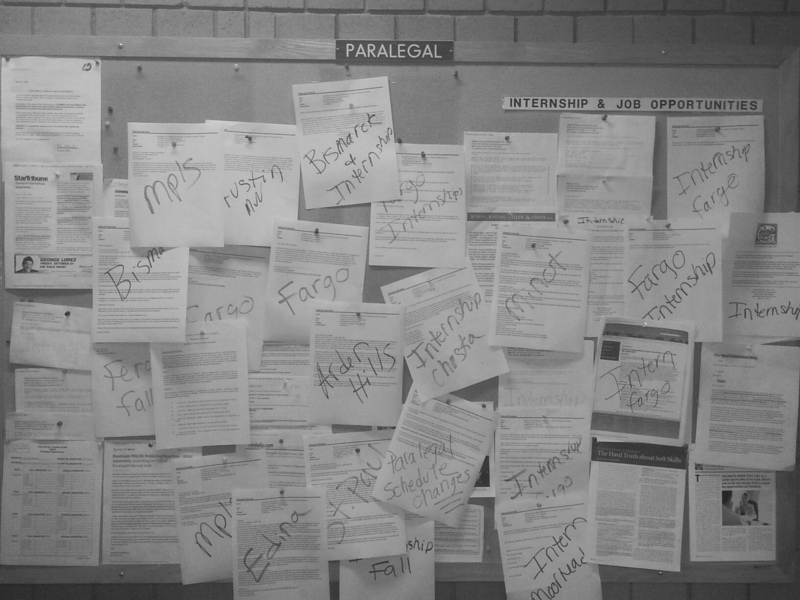 Job and internship opportunities clutter the paralegal board in the Center for Business. MSUM’s paralegal department is calling for more students to join this profession that the United States Department of Labor statistics predicts will have an 18 percent growth in available jobs between 2010-20. The paralegal department is small, however, small does not mean unqualified. Their faculty and adjunct staff are welcoming and willing to have more students interested in the paralegal profession to come on board. MSUM’s paralegal department is one of about 74 bachelor’s programs in the United States who are approved by the American Bar Association. There are no ABA approved bachelor’s programs in North Dakota and only three in Minnesota, including MSUM Kukowski said. Pays attention to detail, organized, thinks critically, enjoys research and successfully communicates through writing are personality characteristics a paralegal profession typically has, according to Hammond and Kukowski. Another reason Hammond chose the paralegal profession is because of the range of opportunities. The paralegal program provides a rigorous curriculum that was actually built from advice from local attorneys and paralegals when the program first began. Therefore, students move into the profession ahead rather than behind. The paralegal graduates from May 2013 are a 50/50 split between working in the Twin Cities and working in the local area. Almost 100 percent of the student graduates are employed in the paralegal field, Kukowski said. Whether graduates decide to travel farther from the Fargo-Moorhead area or not, employers are fond of MSUM graduates and what they’ve learned from the curriculum. Hammond landed a paralegal internship from January to May, and looks forward to graduating in the spring. She is certain she made the right choice.